I don't have too much to say about this batch of polls as a whole, they all seem to acknowledge the current trends, but the Monmouth poll does contain some interesting auxiliary information. Murray [of Monmouth] described the findings this way: "We know that voters who are less likely to go to the polls tend to be somewhat more Democratic in their leanings. However, we rarely see more than a few points difference in the ballot test results for all registered voters compared with just likely voters. 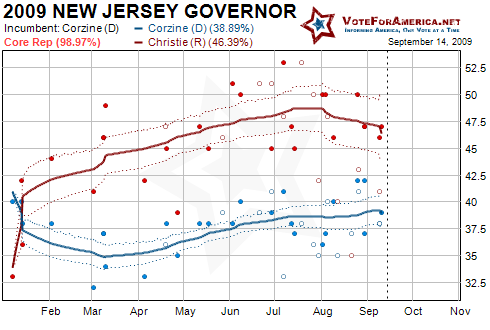 The fact that such a notable discrepancy has shown up in two consecutive polls indicates that there is a decided lack of enthusiasm for the incumbent among the Garden State electorate. While we acknowledge that most of these 'unlikely' voters will never cast a ballot in this race, if the Corzine team can bump up turnout on Election Day by just a few percentage points, their chances of victory greatly increase." "At this point, the likely voter result is our best estimate of where the dynamics of this race stand at this time. We provide the registered voter results in the interest of furthering our understanding of the entire New Jersey electorate's concerns and motivations. The bottom line is that turnout always matters. It just may matter more in this election than usual." The report did not specify the criteria used for determining whether a voter was likely to vote; this appears to have been determined by Braun Research, the telephone data collection agency used in the survey. This information is typically proprietary, but there are some generally accepted methods of determining voting likelihood. There are two main ways to determine the past voting record of an individual; you can either directly ask them, or you can make inferences based upon publicly available voter registration databases. The Help America Vote Act of 2002 requires that states maintain an Statewide Voter Registration System (SVRS) and New Jersey is no exception; the list is public data, but is typically restricted to political uses. As a result, polling firms could request and then use this data to determine the recent voting pattern of an individual. If they voted in the last election, they may be flagged as a likely voter; other criteria is probably used, but this should give you a general idea as to how the separate samples are determined. The question of turnout still however remains and until the votes are counted, we will never definitively know who will vote and who won't.